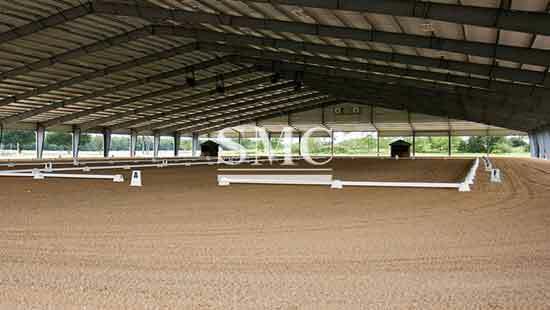 Whether for small pony riding clubs or large international horse shows, steel riding arenas from SMC Steel Structures have proven a wise choice for equestrian enthusiasts all over the country. Many smaller horse organizations love our steel riding arenas because they make it possible for small horse clubs to purchase beautiful riding arenas at an affordable rate without sacrificing safety and long term reliability. Because our riding arenas are easy to maintain, your time and money will instead be left to be spent on the horses. Riding arenas from SMC Steel Structures can be purchased in handy kits which you can assemble yourself, saving you hassle and money. Our steel constructions are also ideal for large riding arenas, where considerable amounts of stress will be placed on the weight carrying parts of the structure. 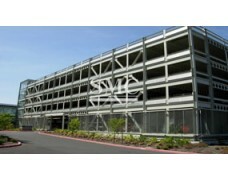 Depending on the steel manufacturing process, different steel types have different properties. 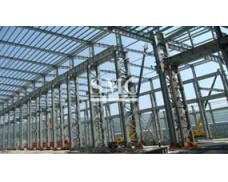 At SMC Steel Structures, we always hand pick our steel types to make sure that each part of your riding arena is constructed using optimal steel quality. 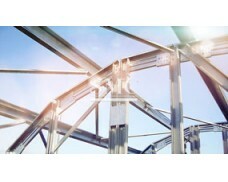 Parts that will hold up a structure will, for instance, be made from super strong steel, while panels need to be lightweight and resilient towards long time wear-and-tear, and will be selected accordingly. 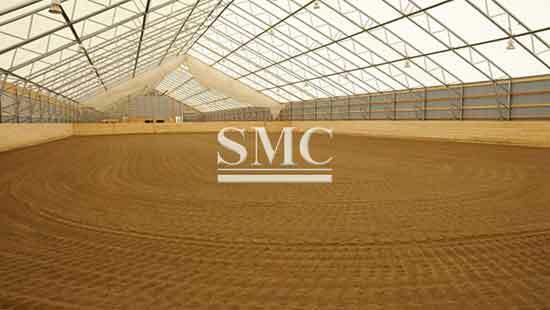 When purchasing your arena from SMC Steel Structures, you’ll receive a safe, long-lasting riding arena at an affordable price. Historically, riding arenas were typically made out of wood. Today, more and more horse lovers opt instead for steel when constructing their riding arenas, since steel is fireproof and resilient towards a wide range of parasite attacks, including mold, mildew, termites and carpenter bees. Fires in wooden arenas can easily turn into disasters for horses as well as for riders and spectators, especially when highly flammable straw or grass is used as substrate. There are many instances where fires in wooden structures have managed to spread to nearby buildings, including stables. A steel structure is fire proof and our high-quality enclosed riding arenas will often be able to contain a fire until the fire department arrives. 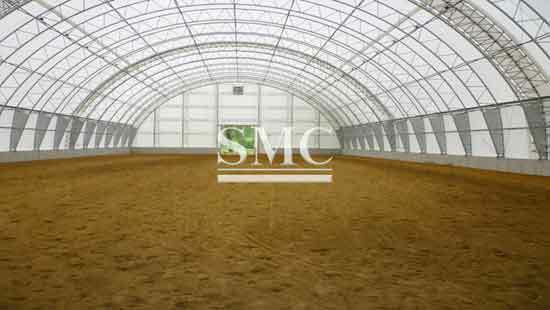 At SMC Steel Structures, we pride ourselves in providing horse keepers with steel riding arenas that are highly suited for the weather conditions in their particular area. Our steel riding arenas can easily be adapted to keep horses, riders and spectators protected from the elements. 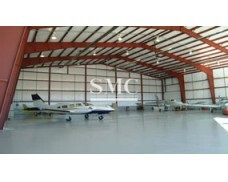 In colder climates, fully enclosed and isolated steel riding arenas are recommended. In milder climates, a roof-only structure can be enough to provide shade. 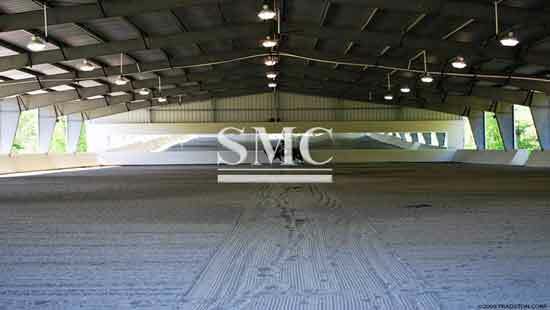 Keep in mind that a well isolated steel riding arena from SMC Steel Structures will not only protect you from the cold, it will keep you and your horses cool during heat spells as well. 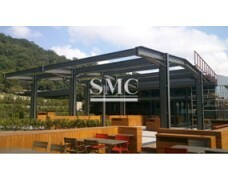 Regardless of the climate in your particular part of the world, you can rest assured that your steel riding arena from SMC Steel Structures will prove resilient towards the environment. Our riding arenas have already successfully combated everything from hail storms and heavy snowfall to severe storms and seismic stress. When you order your steel riding arena from us, it is important that you consider the specific requirements that the climate in your area will put upon the structure. 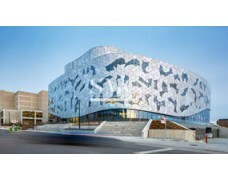 Our knowledgeable staff of technicians will be happy to guide and help you. 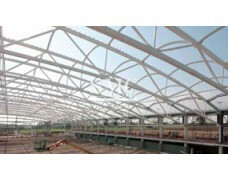 Erecting a riding arena from SMC Steel Structures is easy and time-efficient. If you prefer to hire contractors, we can help you to find a contractor in your area whom we have worked with in the past and can recommend.